Radio Detection and Ranging (radar) is the most common type of speed measuring device in Virginia. Unlike lidar, which is “point and shoot,” radar requires training and experience to produce reliable results. All radar units consist of a display, the counting unit, and at least one antenna. Handheld radar guns have all three components inside a gun-shaped body. Most radar units in Virginia are not handheld and are mounted inside the police cruiser instead. Their radar antennas are usually mounted on the front and back dashboards and the counting unit is usually mounted on the dashboard or center counsel. The display (if separate from the counting unit) is also on the dashboard. Modern police radar in Virginia emit microwaves (not pulses). These microwaves are continuously emitted from the antenna at an angle of approximately twelve degrees for a distance of over 4,000 feet (or until contact is made with an object). The microwaves continuously reflect off of any objects within the beam’s path and return to the radar unit where they are detected. When striking a moving object, the waves’ frequency shifts either up or down (this is called Doppler shift). The more altered the returning frequency, the higher the relative velocity of the object. Objects traveling toward the radar unit cause the frequency of the radar beam to increase while objects traveling away from the radar unit cause the radar frequency to decrease (this phenomenon is what causes an approaching car to sound higher and a retreating car to sound lower). By measuring the Doppler shift, radar units can calculate the relative speed and relative direction of any vehicle inside its beam. When a police cruiser uses radar while moving, the radar unit is placed in moving-mode. In this mode the radar unit measures the cruiser’s speed by measuring the speed of the ground in front of the police cruiser. The radar unit adds the cruiser’s speed to the relative speed of the target vehicle if the target vehicle is traveling in the same direction and subtracts it if the target vehicle is moving in the opposite direction. Some moving-mode radar units requires the cruiser to be moving at a certain minimum ground speed (e.g. 20 mph) or require the target vehicle to have more than a certain minimum relative speed (usually more than three) in order to produce a reading (i.e the radar unit will not work if the cruiser and the target car are going within three mph of each other). Because moving radar must measure the ground speed of the cruiser and the speed of the target vehicle, there is much more potential for error. In order to use moving radar accurately, an officer must check the radar’s ground speed against the cruiser’s calibrated speedometer during the measurement. A proper tracking history is also very important. Most Radar devices can be used while the officer’s cruiser is stationary or moving. In moving mode the Radar device must measure the cruiser’s ground speed as well at the relative speed of the target vehicle. Most Radar devices accomplish this by using two different Radar frequencies. 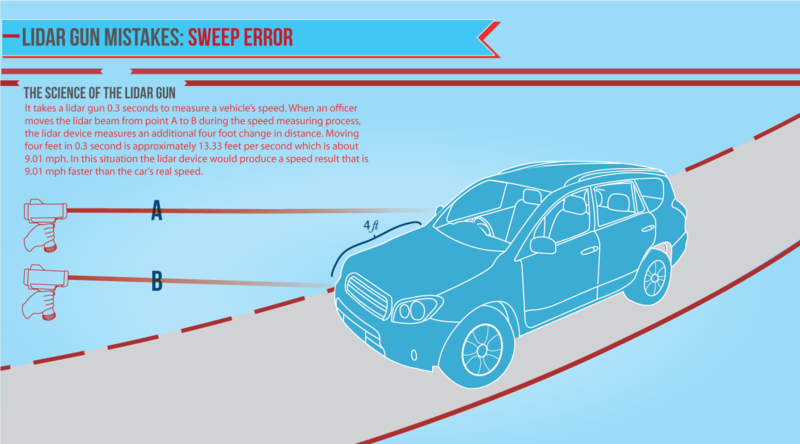 One frequency measures the speed of all moving objects within the Radar’s beam and the second frequency is dedicated to measuring the relative speed of the ground directly in front of the police cruiser. The small portion of the Radar beam dedicated to measuring ground speed in front of a cruiser is called the “hot spot”. Most of the moving mode Radar errors are caused by interference to the hot spot. All Radar devices are designed to measure the speed of an object that is traveling directly towards the speed measuring device or directly away from the device. Any time the target vehicle is moving at an angle to the device the measured speed will be lower than the real speed. In stationary mode, this error benefits the drivers. However, in moving mode, when cosine error affects the ground speed measurements the target vehicle’s measured speed may be erroneously higher than the target vehicle’s actual speed. If the police cruiser is near large reflective objects (like as road signs) or if the road is very reflective (like when it is wet or icy) the hot spot can lock onto a stationary object that is not directly in front of the cruiser. The greater the angle between the police cruiser and the stationary object the greater the cosine error will be. The greater the cosine error the lower the ground speed reading will be. Cosine error is a common cause of erroneously high speed readings in moving mode. When a Radar device is operating in moving mode, any error that affects the Radar’s ground speed measurement also affects the accuracy of the overall speed measurement process. When the hot spot (the portion of the beam dedicated to measuring ground speed) locks onto a moving object it creates a shadowing error. When the hot spot locks onto a moving object the relative speed of the moving object and the cruiser is lower than the actual ground speed of the cruiser. A lower ground speed will always cause an erroneously high target speed reading when the target vehicle is moving in the opposite direction from the cruiser, and may sometimes cause a higher speed reading when they are moving in the same direction. The most common problem with radar units is that they detect and measure all objects in the radar beam’s path but only display one or two speed results at a time (depending on the make, model, and operating mode of the device). Most radar unit in Virginia will only display the fastest speed it receives and/or the speed of the strongest signal received. Signal strength is related to the target vehicle’s size, distance from the radar antenna, material make-up and the vehicle’s location within the beam. After a radar unit displays the speed of an object, it is the police officer’s job to decide which vehicle is responsible for the speed displayed. This type of tracking history is essential to guaranteeing that the officer has associated the speed result with the correct vehicle. Radar units cannot track a target vehicle or the cruiser’s own ground speed if that speed is changing too rapidly. Some units cannot accurately measure speed if the cruiser or the target vehicle is accelerating or decelerating more than one mph every .1 – 2.0 second (this is particularly a problem with older units). Harmonics can distort speed readings. Large targets such as trucks and reflective road signs close to the radar unit or the target can cause echoes. Echoes occur when the radar wave strikes the target before or after it reflects off of a moving object and then returns to the radar unit. Reflecting off of multiple moving objects causes multiple shifts in the radar frequency and creates inaccurate speed readings. Erroneous speed readings may be higher or lower depending on the relative directions of the objects. A radar’s auto-lock feature can cause severe problems. Some older units are designed to display speed results or a continuous speed result only after detecting an object traveling above a certain mph limit set by the operator. When such a target is detected, an alarm sounds and the radar unit only displays the target’s speed at the time it triggered the auto-lock. This feature is very unreliable because an erroneous signal may cause a high reading for a split second, thus triggering the auto-lock. Any vehicle that appears to be speeding will be blamed. The auto-lock feature makes establishing a proper tracking history impossible. Most law enforcement agencies around the U.S. have banned auto-lock features and have banned radar devices that auto-lock as their default setting. These devices are not approved for use in Virginia. In Virginia, many speed measuring devices will manually lock if the officer hits a button. Manually locking the speed prior to establishing a proper tracking history is not much more accurate than using an auto-lock feature. Radio Frequency Interference (RFI) can be caused by substations, high-power antennas, and the two-way radios found in police cruisers. Garage door openers, motion sensors, and the abundant electrical equipment found in a police cruiser and along highways can also generate RFI errors. RFI can cause erroneous speed readings. Some of these readings are continuous and steady while others are sporadic. RFI most often occurs when: 1) the officer is parked next to a strong RFI source (e.g. power lines or a radio station antenna. ), 2) the radar unit’s power source has been wired without RFI shielding, or 3) the radar unit’s antenna wiring is bundled too closely to the wires carrying RFI sources such as the stereo’s power source, the CB radio’s power source or the antenna. A complete tracking history will normally allow an officer to detect RFI signals. The fan blades of a police cruiser’s AC unit or heater can produce a radar signal of approximately 15 to 45 mph. This most often occurs when the radar antenna is mounted with the antenna pointing across a defrosting fan vent. The radar antenna should be securely fastened to the cruiser’s dashboard and never point directly across the radar’s counting unit or across defrosting vents. Fan vents and the counting unit can cause abnormal readings, especially when no stronger signals are around. Correct mounting and a complete tracking history will help prevent false readings caused by these types of errors. An officer should also test the radar unit by pointing the antennas along an empty road, turning the fan on high and turning up the radar unit’s sensitivity. If a false signal is produced then the antennas’ mountings should be inspected. Weather conditions such as precipitation, temperature, and humidity can limit the range of radar and contribute to false readings. This most often occurs when there is water, ice, or snow on the road surface and when the officer is operating in moving mode or in a place where harmonic signal interference is more likely. Because of these issues the Virginia State Police are instructed not to operate radar (or lidar) when there is any measureable precipitation. Law enforcement officers should calibrate their radar units at the beginning and end of each shift. Radar units are calibrated by using special tuning forks. The tuning forks are calibrated every six months and produce a frequency that is equivalent to the Doppler frequency of a target moving at a very specific speed (usually 35 or 65 mph). To perform the test, an officer puts the radar unit in test mode and strikes the tuning fork. The officer then places the fork inches away from the radar antenna and verifies that the device is accurate to within one mph. For use in moving mode, the officer must test the radar unit with both tuning forks simultaneously and then again separately. Each device comes with its own individual set of tuning forks. Different radar devices may use different radar frequencies so the tuning forks from different radar devices may not be interchangeable. Every six months, officers are required to calibrate their tuning forks. Radar tuning fork calibration is done at laboratories here in Virginia. Each tuning fork should be accurate to plus-or-minus one mph and the radar unit must agree with the tuning fork within plus-or-minus one mph. Thus, the tolerance for a radar unit is plus-or-minus two mph when in stationary mode and plus-or-minus three mph in moving mode. (The speed measurement is a sum of the radar’s ground speed and relative target speed which both have a tolerance of plus-or-minus one mph). The possession of devices used to thwart speed measurement devices is illegal in Virginia. In Virginia, some law enforcement officers have radar-detector detectors and patrol with these detectors to find and ticket people who are using radar or lidar detectors or jammers. 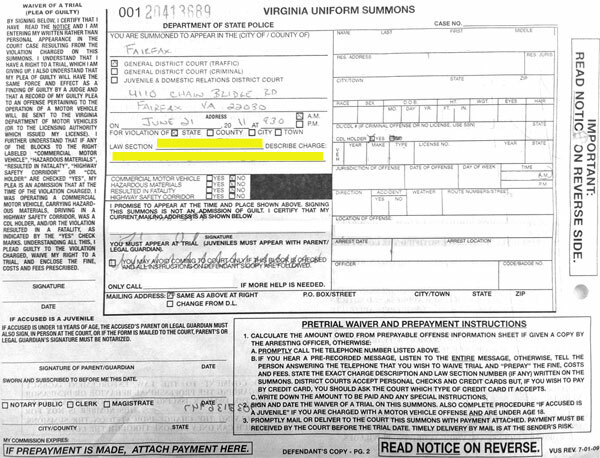 Simply having a radar detector in the car violates Virginia law, and the prosecution does not have to prove that the device was functional. The only legal way a person can have a radar detector is if the device is not connected to a power source and not readily accessible by the driver (e.g. it is kept in the trunk). The fine for possessing a radar detector is approximately $140. But sometimes, possession of a radar detector is also used to justify an elevated punishment in speed cases.